Should You Buy a Used Electric Guitar? Deciding whether you should buy a used electric guitar or a new one can be difficult. On one hand, you have the opportunity to snipe a deal on an amazing guitar that would normally be way out of your budget. On the other hand, you open yourself up to more risks that you don’t have to deal with when you buy a guitar new. As someone who almost exclusively purchases guitars on the used market, I’ve had my fair share of successes and horror stories. 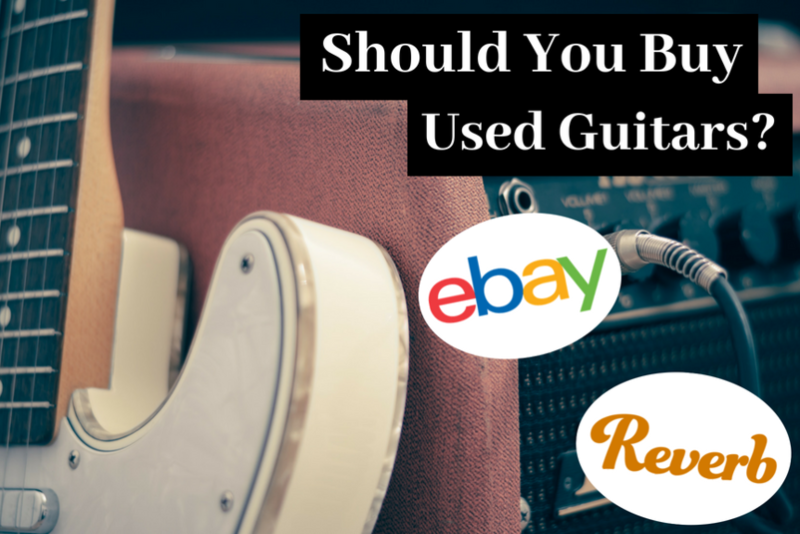 In this post, I’ll be breaking down everything you need to know about buying used electric guitars. You’ll learn about the advantages, disadvantages, best places to buy, and the top tips that I’ve learned throughout the years. After reading this, you’ll be able to decide whether buying guitars on the used market is right for you. Should Beginners Buy Used Electric Guitars? Is Buying a Used Guitar Right For You? If you’re in the market for a guitar, you should at least consider buying it second hand. Otherwise, you could be missing out on an awesome opportunity. If you’re on the fence, here are some of the major advantages of buying a guitar used. Price is an obvious one. The main reason anyone would opt to buy a preowned guitar instead of a new guitar is the price. Buying a guitar used can shave off hundreds, or even thousands of dollars depending on where you buy it. It doesn’t matter what model of guitar you’re looking for, chances are that someone is selling it. Think about it. You basically always have the option of saving money when you’re buying a guitar. That idea always seemed cool to me. Sure, the used guitar may be a couple of years old. But, guitars are basically built to last forever. You can find guitars from back in the 1970’s that are still in pristine playing condition. It’s not like a phone or computer, where the technology is outdated after a year or two. So, it really doesn’t make a difference if you buy a 2016 model of a guitar versus a 2018 model. Another thing to consider is that instead of buying a guitar new, you can opt to buy an objectively better guitar for the same price used. For example, I was in the market for an ESP LTD EC-401. This guitar sells for just under $700 new. However, rather than buying it new I went online and found a deal on a used ESP LTD EC-1000 Deluxe for $550. The LTD EC-1000 is an objectively superior guitar to the EC-401. They’re both in the same line of guitars, but the EC-1000 is one step up. By deciding to buy used, I ended up getting a better guitar than what I was originally looking for. And on top of that, I saved $150. Getting more for less seems like a pretty good deal to me. When you’re buying a used guitar, remember that the current owner of that guitar probably used it as their main guitar at some point. It’s fairly common for guitar players to upgrade their guitars so that it fits them better. So when you’re browsing on the used market, often times you can find guitars that have significant upgrades, such as pickups and hardware. And the best part about it is that sellers can’t really mark up the price by too much, despite how much money they put into the upgrades. Think about it. If someone sees a listing for a used guitar that costs more than if they were to buy it new, they aren’t likely to buy, regardless of whether the guitar has been upgraded. As a result, the seller normally just has to take the financial hit on any upgrades they make when they’re reselling. This means you can potentially end up with a superior guitar than if you were to buy the same model new, and it’s at a lower price. Here’s a great example of this from my own personal experience. I was looking to purchase a Sterling by Musicman JP60 as a backup guitar for practice. This is a budget version of John Petrucci’s signature Ernie Ball Musicman JP6. Buying this guitar new would be around $650 depending on where you buy it. Keep in mind that since the JP60 is a cheaper import guitar, it uses generic Sterling by Musicman pickups rather than John Petrucci’s signature pickups that are found in the JP6. So, instead of buying the JP60 new, I decided to browse online to see if I could purchase this used. As it turns out, I saw a listing for the JP60 with a whole heap of amazing upgrades. The previous owner had replaced the mediocre stock pickups with the John Petrucci’s signature Crunch Lab and Liquifire pickups, which sell for $150 on their own. On top of that, the seller upgraded the hardware including metal volume and tone knobs, a new 3-way toggle switch, and upgraded 5K pots. When you factor all of these upgrades as well as the labor of installing, this guitar easily had over $300 worth of upgrades. The best part was that I got this guitar in mint condition for only $600! My mind was blown because I ended up getting a guitar that was substantially better than if I had gotten it new. And on top of that, I saved $50. When you’re buying a used electric guitar, there are a lot more options available to you. When you’re buying a guitar new, vendors typically only like to stock guitars of that current year. Since many guitars are released with certain features and finishes with a limited run in a year, it severely limits your options if you buy new. For example, PRS likes to release the same guitar in different finishes every single year. The color options for the 2018 models differ from the 2017 models. Also, some years they’ll have limited releases on versions with different features, such as a Floyd Rose tremolo. If there’s a particular finish or design that you want, it might not be available anymore. However, if you buy used, you have the option to seek out the exact model from whatever year you want. When you’re buying guitars used, especially online, you’ll often get some freebies. If someone is selling their guitar, it’s likely that they’re just trying to get rid of it. Think about it. If someone is getting rid of their guitar, does it really make any sense to keep its accessories? It’s much easier to just bundle the guitar with them so they can get rid of everything at once. I’ve bought plenty used guitars online where the seller included a hard case, cable, tuner, picks, and a strap all bundled with it for free. As I mentioned previously, some guitars simply can’t be bought new anymore. There are some older models of guitars that are an amazing value for the money. I like to call these guitars the hidden gems. An example of this would an Ibanez RG570 made in Japan. Back in the 1990’s Ibanez used to have all their guitars manufactured in Japan. These guitars were very high quality. Sadly, over the years Ibanez has since moved their production for their budget guitars to cheaper factories in Indonesia, and the quality has decreased. Nowadays, the Japanese factories are reserved for their prestige line of guitars, which are significantly more expensive. 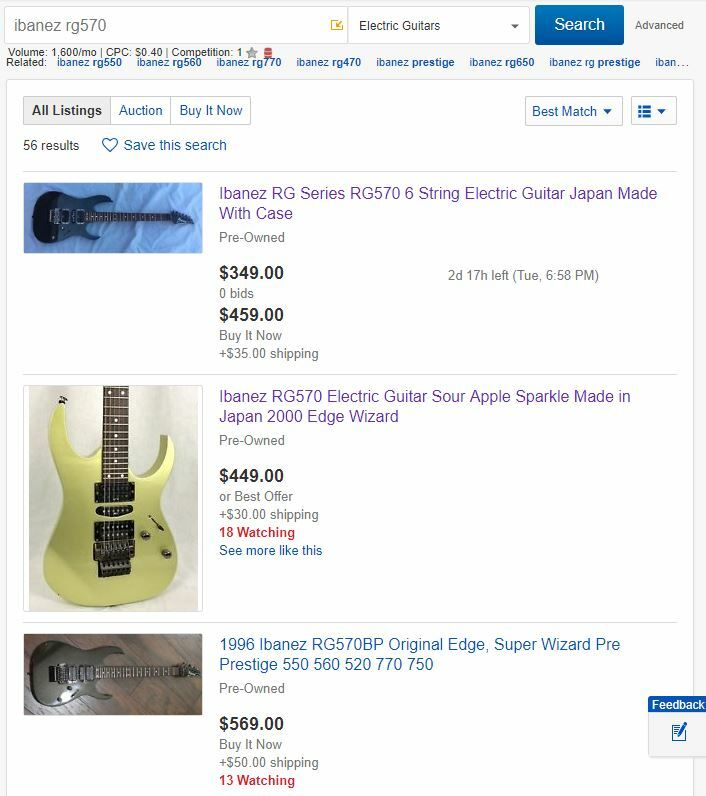 However, if you look on the used market, you can still find the older Japanese guitars, such as the RG570, for extremely cheap. 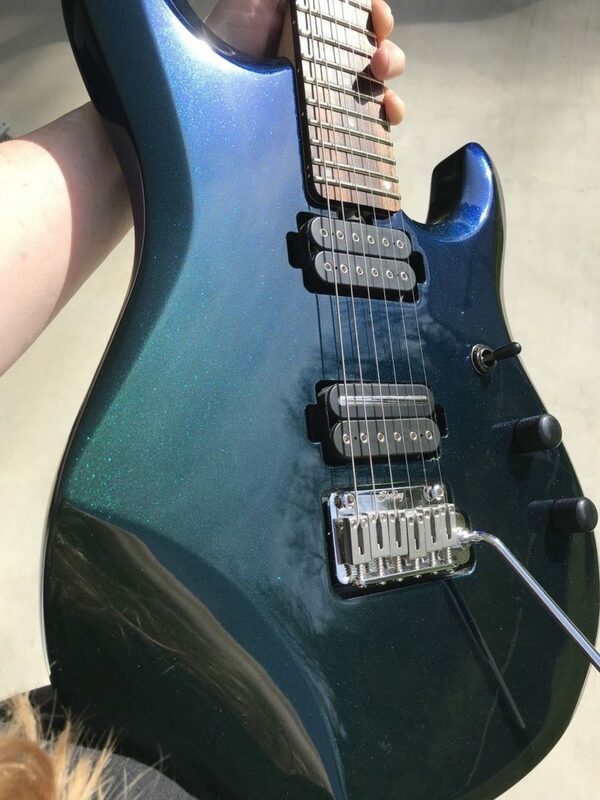 The Ibanez RG570 is of the same quality as an Ibanez Prestige guitar but can be found on the used market for under $500, which is an amazing deal. And that’s just one example. There are plenty of other hidden gems available on the used market. You just need to know where to look. Though buying a guitar on the used market has its fair share of advantages, there are also some risks associated with it. Here are some of the major disadvantages that you should consider before making the decision to buy used electric guitars. When buying used electric guitars, you typically won’t have an extended warranty directly from the guitar manufacturer. However, this really hasn’t been an issue for me. If you’re buying from a reputable vendor, such as eBay, Reverb, Amazon, or Guitar Center, they’ll usually have a buyer protection program or return policy. If you purchase a used guitar that you’re not happy with, you can just send it back within a certain time frame. Often times, when you purchase a used guitar, you’ll have to get it cleaned and set up again. When people go to sell their guitar, it’s likely that they’ve stopped using it and stored it away. As a result, you’ll definitely have to change the strings, and maybe even do some truss rod adjustments. Sometimes you’ll get a guitar that’s perfectly set up and ready to play, but in most cases, you’ll at least have to change the strings. This is kind of expected when you’re purchasing a used guitar. Since these instruments likely have hours of play on them, there will likely be some general wear and tear. This could include scratches and chips on the finish, loose knobs, wear on the frets and damaged hardware. Be sure to check for these, especially if you’re purchasing online. Make sure you carefully read the description and look at all of the pictures listed. Though used guitars are expected to have some general wear and tear on them, it’s usually not a problem. Guitars a built to last for a very long time, so there’s really no harm if it’s seen a bit of use. As long as the guitar has been well taken care of, general wear and tear aren’t too much of an issue. Of course, when you’re purchasing used gear online there will always be people who are trying to scam you. It’s unfortunate, but it’s the world we live in. Some vendors will try to take advantage of novice guitar players who don’t know any better. It’s common for people to post inaccurate listings trying to play off their cheap guitar as a higher end one. There are plenty of great deals out there, but it can be difficult knowing where to look. Here are some of the best places to buy used gear from my personal experience. eBay is obviously that largest online platform in the world for purchasing used products, including musical instruments. Shopping on eBay is great because the selection is absolutely enormous. When someone wants to sell their guitar eBay is the first place they think of, so you’re likely to find anything and everything on there. Also, I’ve noticed that people who sell on eBay really need to get rid of their stuff quickly, which is why they choose eBay in the first place due to their massive audience. As a result, you can often score some amazing deals up to 50% off of new price. Another advantage of buying on eBay is their customer service. eBay is extremely buyer sided, offering a money back guarantee policy. You can buy your guitar with confidence knowing that eBay has your back if the seller tries anything shady. If you receive your guitar and have any problems with it, you can rest assured knowing that eBay will get you your money back. Similar to eBay, Reverb is a huge online platform for buying and selling used products. The major difference is that Reverb is specifically focused on musical instruments and gear. One of the best benefits to using Reverb is that you know the person who is selling is a guitar enthusiast. This means it’s more likely that they’ll know how to handle a guitar. From my experience, I’ve noticed that all of the listings are accurate and the guitars I’ve received have been in excellent condition. This is likely due to the fact that sellers are actually knowledgeable about guitars and know how to describe them accurately in their listings. I’ve found that on average, Reverb tends to have less scammy postings, though I’m sure they do exist. The one drawback to Reverb is that since musicians likely know what their instrument is worth, you’re less likely to score an amazing deal. Guitar Center is obviously a huge brand when it comes to selling guitars. Their used catalog is huge, as people can easily trade in their gear for quick cash. One of the greatest advantages that Guitar Center has over Reverb and eBay is flexibility. Since they have physical stores, it means you can actually go into a store and try out the guitar before you buy. This way you know exactly what you’re getting. On the other side, you can also just purchase online if it’s more convenient for you. But the cool thing about Guitar Center is that you have the option to mix the two. You can go online to Guitar Center’s website, find a guitar, and request that it be sent to your local store from any Guitar Center in the country. Then, you can try it out and return it if you don’t like it. 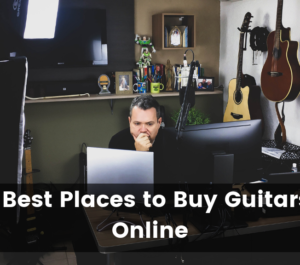 There are plenty of other places to buy used instruments such as Sweetwater, Sam Ash, and other local guitar shops, but between the 3 that I’ve listed, they’ve basically covered all of my needs. I usually stay away from Sweetwater and Sam Ash because I’ve noticed that their prices are usually really high comparatively. Shopping for electric guitars on the used market inherently has some risk involved. There are a lot of factors you need to consider before pulling the trigger. If you don’t, you can bet that you’ll run into some issues along the way. Here are some tips that I’ve learned over the years to help you know what to look for when buying a used guitar. The most important tip is to know exactly what guitar you want before you start browsing for used listings. Don’t just hop on eBay and browse for random guitars that you’ve never heard of before. You should know the exact model, specifications, year, and factory the guitar was made in right from the beginning. This way you’ll easily be able to identify if a used listing is trying to scam you. For example, someone is advertising a specific model of guitar you want and you see that its specifications or finish don’t match, it might be a scam. Be sure to carefully read the entire product description. If it’s a good seller, they’ll write a thorough description of the guitar they’re selling, so you know exactly what you’re getting. Also, a trustworthy seller should always be completely transparent with any defects on the instrument. They should clearly state any damages to the finish, electronics, and hardware. They should also include a bunch of images depicting any dings on the guitar. If they fail to write a good description, then it’s an instant red flag in my books. As I previously mentioned, when purchasing a used guitar, there’s a chance that the previous owner could have upgraded it. However, on the flip side, there’s a chance that they could have downgraded it as well. Though it’s definitely less common, sometimes if a guitar has really good signature pickups, people will take out those pickups before selling them and sell the pickups individually for a higher price. Here’s an example from my personal experience. I purchased a used PRS SE Mark Holcomb guitar on Reverb. This guitar normally comes with Mark Holcomb’s signature Seymour Duncan Alpha and Omega pickups, which is a $250 pair of pickups. 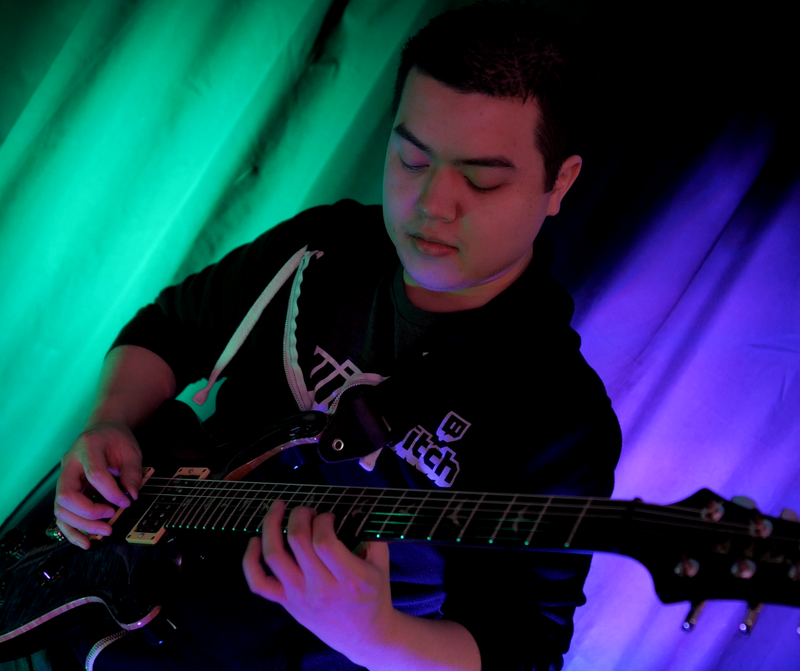 However, when I received the guitar, I noticed that its pickups were swapped for lower quality PRS SE pickups. It turns out it was posted in the product description, though it was very misleading because the pictures on the listing showed the guitar before the pickups were swapped. It never crossed my mind to look for this sort of thing because in my mind it would defeat the purpose to remove signature pickups from a guitar. Without Mark Holcomb’s signature pickups, is it really a Mark Holcomb signature guitar? Nonetheless, the seller swapped out the pickups to sell them on their own for a higher price, and since it was in the product description, I was out of luck. If you’re browsing a for used guitars online and see that a listing doesn’t include real images, it’s an instant red flag. You’ll see a lot of listings with generic product images with white backgrounds that look like they’ve been pulled right from Amazon. I never buy from these sellers because there’s a lot more risk involved. If you’re buying a used guitar, you want to see real pictures of the actual guitar you’ll be getting. This way you’ll be able to see any imperfections before you buy. If the seller isn’t going to be completely transparent, then it’s not worth taking the risk. You should really have a solid understanding of how much a guitar is worth before you start buying. And I don’t just mean know how much the guitar sells for new. Different brands of guitars have different resale value when sold on the used market depending on popularity and demand for it. Understanding the resale value of electric guitars will potentially allow you to find a great deal on a guitar. Guitars such as Gibson Les Pauls and Fender Stratocasters retain their value very well because they’re super popular everybody knows about them. Other brands such as Ernie Ball Musicman, Mayones, and Kiesel, aren’t as well known, so despite being on par in terms of quality, they don’t hold their value as well because their is low demand. Since not a lot of people are looking to buy these guitars, sellers usually have to lower the price if they want to sell them. Check out my article on guitar resale value that explains it in more detail. When purchasing used gear, you should always try to negotiate for a lower price. There’s simply no reason not to. Tons of listings on Reverb and eBay have the option to make an offer, so take advantage of that. Think about it. Why would the seller include the option to make an offer on a listing in the first place if they weren’t willing to accept a lower price? Even if you’re not buying online, you can even negotiate in person or over the phone when you’re buying at Guitar Center or Craigslist. This is probably the easiest way to save money. Obviously, there’s a lot that goes into buying a used electric guitar. It can be pretty overwhelming if you don’t know what to look for. So if you’re a beginner, should you even bother shopping for a used guitar, or should you just buy new? In my personal opinion, if you’re looking for your very first guitar, I’d just opt for a new one. If you’re a beginner, you simply don’t know what to look for in a guitar. As a result, there’s a much higher chance of getting scammed. Buying new will give you a much easier and more consistent experience. There are plenty of amazing budget guitars for beginners that you can choose from that will help you get your feet wet. Once you’re committed to playing the guitar and want to upgrade, then I would suggest shopping for a used guitar. Now you might be asking, why not search for the guitars listed above on the used market? The problem with buying entry model guitars on the used market is that they are not really built to last that long. If someone is selling one on the used market, then chances are that there is something wrong with it. Or at the very least, you won’t really find a good price on it since people won’t be looking to sell them for much less than the regular price. I would honestly just pay the little extra and get the guitar new. Guitars meant for intermediate to advanced level players, have significantly better build quality and are meant to last. These are the types of guitars that I would consider buying used. To sum things up, there’s a lot that goes into purchasing a used guitar. As I’ve mentioned, I’m a huge advocate for used guitars. So much so, that I almost exclusively buy my guitars used. But does that mean you should shop for a second-hand guitar as well? That will depend on what’s important to you. In my opinion, everyone should at least consider it. I compare guitars to cars. You never really need a brand new one. In most cases, the positives of buying used far exceed negatives. If you’re looking to save some money and are okay with having a slightly older model of guitar, then I’d definitely go with a used guitar. On the other hand, if you’re a beginner or someone who doesn’t want to be bothered with doing your research, then buying new will give you a more consistent experience. I hope you found this post helpful. For more guitar related articles, be sure to check out my other posts here on Guitar Advise. 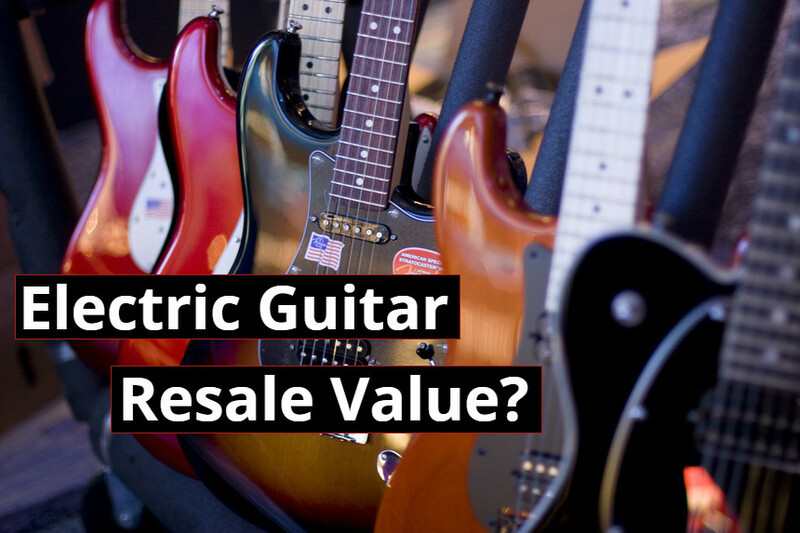 Which Electric Guitar Brands Have the Best Resale Value? 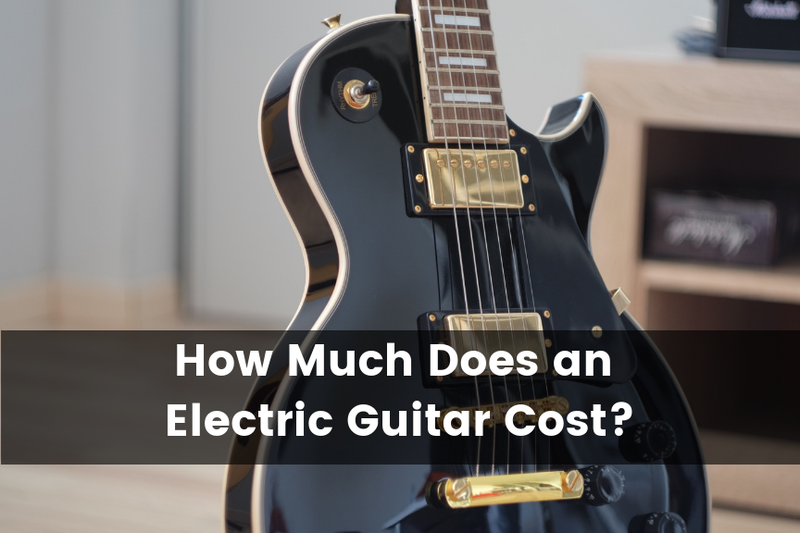 How Much Does an Electric Guitar Cost? 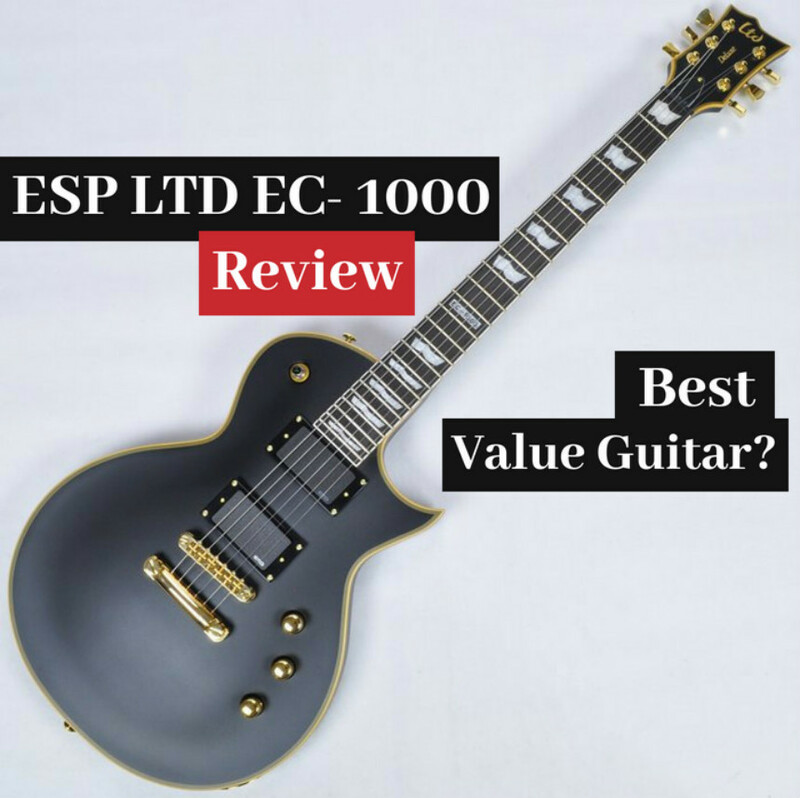 ESP LTD EC-1000 Deluxe Guitar Review (2019) – The Best Value Guitar?